Thanksgiving... Thankfulness at its best requires fond reflection. Given my hiatus from blogging and cruising of late, the time seems right for a nostalgic blast from the past, as well as an breif update. Indeed, we have much to be grateful for -- this is but a teeny tiny piece of it. We trust that if you are reading this post now, you too are blessed with internet access you are by its very nature connected and also probably not starving. What is cruising like on Thanksgiving, celebrated in places far from family? Here's a quick recap on our last 5 years spent somewhere other than home, although in many ways, wherever we were at the moment, aboard the good ship Journey, was home for us. where I was finally able to repay them for picking up our drinks in Vanuatu. Fellow "Yanks" (the nicer term Ozzies use for those of us hailing from the USA) Chris and Chris of Scintilla, who call themselves "C2" eagerly organized hosted Thanksgiving dinner with us and another Statesider, Eve of Auntie. It was kinda different to be in a UNESCO world heritage site for Thanksgiving last year, "stuck" there a bit longer than anticipated do to challenging sailing conditions. Our larders were pathetic and grocery shopping in this remote natural treasure was not an option. No turkey, no cranberry anything, no sweet potatoes, no stuffing, and no pumpkin pie. Even if we hadn't been on Fraser Island, turkey was not common in Australia or New Zealand. The only meat we had left was about a half-dozen frozen chicken drumsticks and one chicken breast. While none of us had the traditional trimmings, we had each other, and the right spirit. And it was good -- right down to seeing real, live pink dolphins (which did not eat!). Thank you Chris and Chris and Eve. Chris and Chris's boat is still in Australia, though they may temporarily be in Hanoi now. Eve we believe is either still in Australia, or Indonesia-bound. 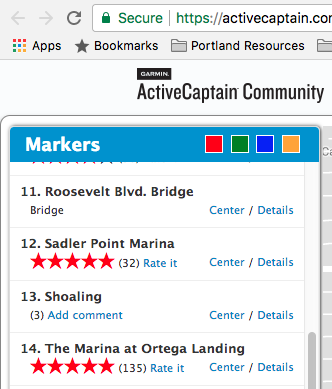 We hope to see C2 either in the Pacific Northwest or Mexico, though we're not sure when. Friends Steve and Patty of Armagh, a recent photo of them in Samoa, pilfered from Pam Selix of Pied de Mer's Facebook. Out of the of the 30 countries we cruised, New Zealand earns our top vote we most wanted to call home. No surprise then the incredibly welcoming Kiwis from the local yacht club put on a Thanksgiving dinner at Opua Bay of Islands Marina's restaurant. Despite a lack of family-style servings -- Thanksgiving is a bit about gluttony, seconds and thirds -- the restaurant got it mostly right, even if the stuffing was coiled inside a turkey roll. We appreciated one of the hosts, a local Bursco manager (the "West Marine" of New Zealand) earnestly asking for feedback on what they got right and should improve for future Thanksgivings. Mostly, we were stoked to celebrate the holiday with friends Steve and Patty of Armagh. We met them originally in the Galapagos and cruised with them for many thousands of miles. We last saw them in New Caledonia. 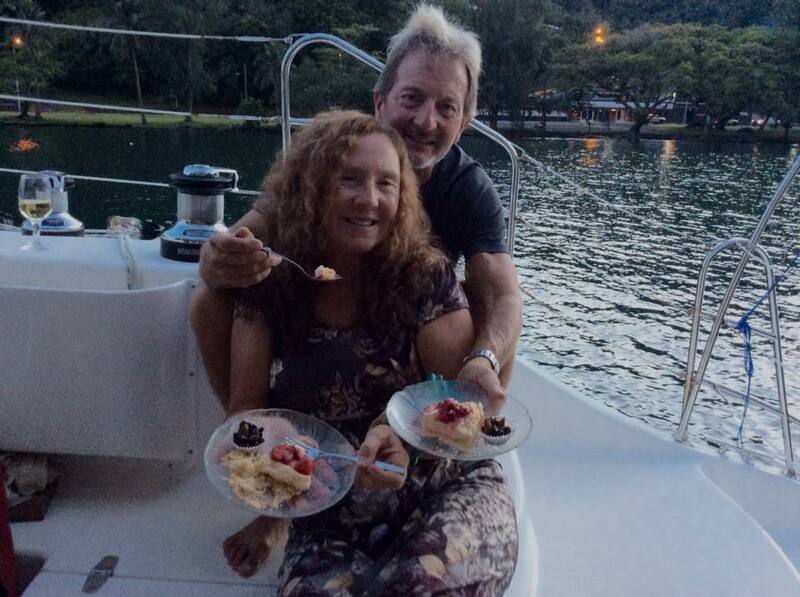 They and Pam and Eric of Pied de Mer left a few days ago to spend the next month sailing from Samoa to Hawaii. Guessing they will celebrate Thanksgiving when they finally arrive in Hawaii. Please join us in wishing them a safe passage. We hope to see them cruising in the Pacific Northwest or Mexico. 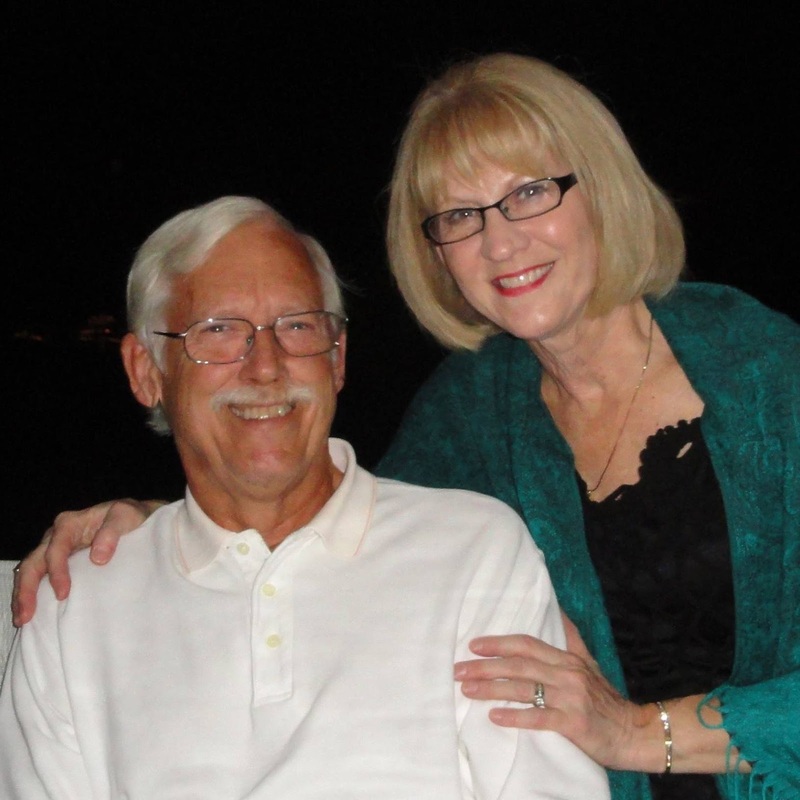 Bill and Kate, the incredible behind-the-scenes hosts of Ortega Landing (image pilfered from Kate's Facebook). Kate is usually behind, rather in in front of the camera. Jacksonville Florida surprised us -- we didn't expect to like it so much, but we did. We picked it as a hurricane hole for between cruising seasons, a place to work while not cruising. From practically our first day there, Allen and Michelle took us in as fellow Pearson owners. We still feel touched by their incredible kindness and generosity, and miss them. We are sad to hear Allen has his Pearson, Incommunicado, for sale, though whoever buys it will be getting a much loved and exceedingly well maintained boat. Maybe they can even persuade Allen and Michelle to join them -- they'd be hard pressed for more enjoyable company. 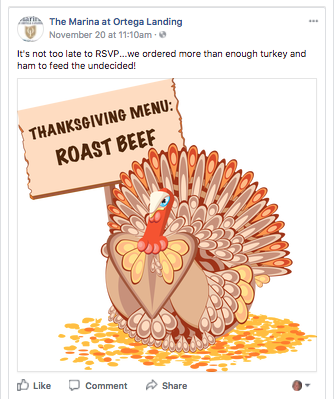 Image pilfered from Ortega Landing Marina's Facebook page for Thanksgiving this year. By the time you read this it is too late -- for this year. 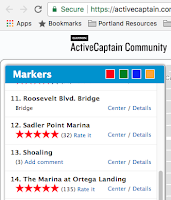 Thanksgiving at Ortega Landing Marina was just one more reason that marina set the Active Captain (and our own) bar for excellence - kudos especially for that go to Kate and Bill. The marina charged very little for an ample serving of excellent food, supplemented handily with a dazzling array of goodies brought from us cruisers, and more importantly, all-around good cheer. We especially miss Dee and Ron, Patty, and Don and MaryAnn and their adorable cat Kai, who we are long overdue to catch up with and Ann of Krazy Lady who we haven't seen since the Bahamas, but still keep up with frequently. We have no idea where or when we will meet again, and look forward to the day. Patty, sadly, we narrowly missed when she was in the Portland area on her 5th wheeler due to traffic and our picking up Serendipity (our current watery home). I have faith we too shall meet again, though when and where is a mystery. Lili and Tomaz, we thank you for one of our all-time favorite Thanksgivings. Nothing pleased us more than the opportunity to share one of the very best USA traditions with you. Who know how lucky it was for the two of us to be the only folks scrappy enough to live aboard our boats in the yard in the blistering tropic heat of St. Lucia? Not only were we pleasantly surprised we were able to serve darned close to what we'd consider a "proper" Thanksgiving -- turkey, stuffing, cranberry sauce, a salad, mashed potatoes with gravy and pie, for dessert, you taught us our most important lesson about celebrating Thanksgiving abroad. Lili and Tomas, I hope somehow we meet in Slovenia, I would love to see you and the stunning Slovenian countryside and love all the incredible underwater photos you share in your blog. Looking forward to belatedly celebrating our Thanksgiving connection over Skype in the mean time. 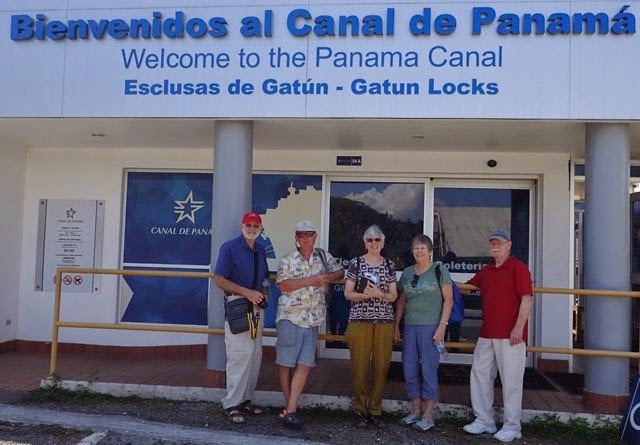 Ron, Wayne, Tricia, Gunnel and Phil at Panama Canal's Gatun Locks, before we crossed it together in s/v Journey. In a bit we head over to the lovely culprits who got my husband, then me, hooked on cruising, Wayne's Dad, and his wife Gunnel. I feel particularly blessed for such incredible in-laws. 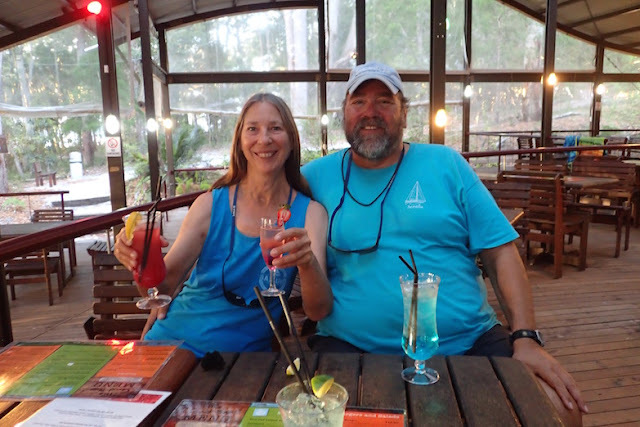 Phil and Gunnel are the only stateside folks who joined us in 5 years of cruising, other than friends Ron and Trish, who we are grateful for being their house-sitters as well as humbled to be among their friends, who joined us cruising (crossing the Panama Canal). We'll go with the traditional trimming, mostly. Turkey, my home-made cranberry relish, stuffing (trying out Trader Joe's gluten-free stuffing mix this year), traditional-for-me savory Southwestern sweet potato pie tweaked to sit inside a gluten-free gingersnap crust, and this year trying out Marilyn Michael of NW Women's Boating's Yam Curry Thanksgiving Surprise. This year we miss celebrating Thanksgiving in unlikely tropical places, eating who-knows-what among our cruising friends and many international hosts. Wherever you are, we are with you in spirit and wish you the very best. For the rest of the family.... Mom and Dad, while we're not with you on Thanksgiving this year, I am so glad to finally be able to see you again. Mary and Patty and Jason and Ryan and Lauren, Jack and Pat, Don and Deana and Elizabeth Brianna and Adam ... we hope to see you in the not to distant future and hold you closer to our hearts than our geography implies. Dad and Adrianne, still sweet at 93 years old. 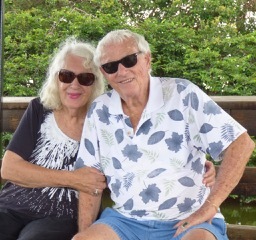 Mom and Richard, my two favorite lovebirds in Florida. June 2017. 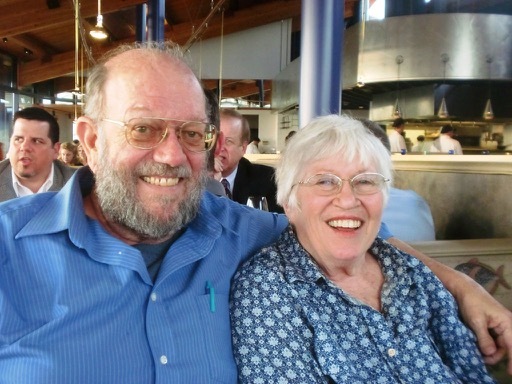 Larry and Nancy of Jacari Maru - still cruising. May we do right by you on your former boat, now our Serendipity. We do not know if 2018 will find us celebrating Thanksgiving in Portland or not. For now, we are grateful daily to friends Larry and Nancy to entrusting us with Serendipity, our waterfront home. We are employed, Wayne back Horizon Air, me, grateful for the support of my boss, colleagues and customers at Portland's West Marine flagship store (and to the folks in Jacksonville' Florida's flagship store for giving me my first and second seasonal jobs with West Marine there). While it has been difficult to muster up the energy for posts of late, there are still stories (and posts) to tell of adventures past, present and future. Some of them will also be shared at the upcoming Seattle Boat Show in late January, where I will be presenting as part of NW Women's Boating's panel as well as a few of my own presentations. More than anything, we are overwhelmed by the many who have showered us with boat karma, both from the boating community and the many places we've visited. Wow! We made it halfway around the world (our plan) on a small sailboat, relatively unscathed with more than a lifetime of unparalleled experiences in those five years. We would love to spend the rest of our life paying it forward and back. Future adventures await. We can hardly wait! Cool pictures of cool places? You betcha. Don't forget it is those you love the most that make it all worthwhile.